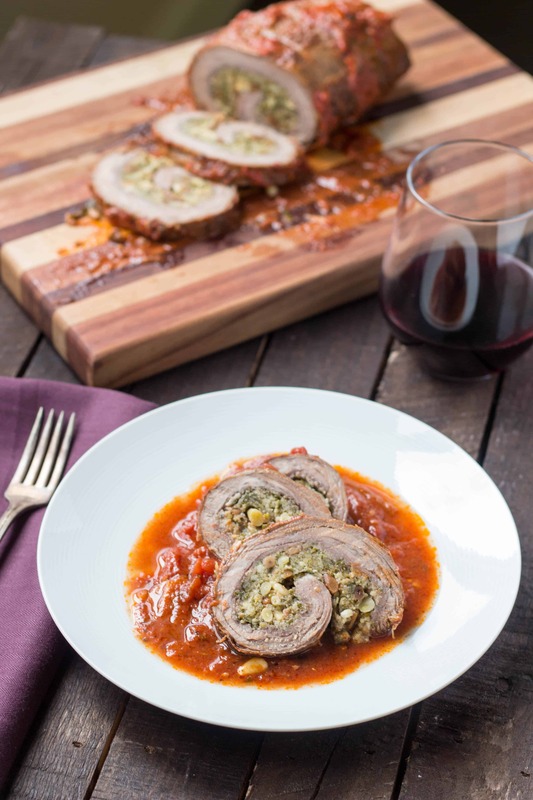 This classic recipe for Italian Braciole is the best you’ll ever have! 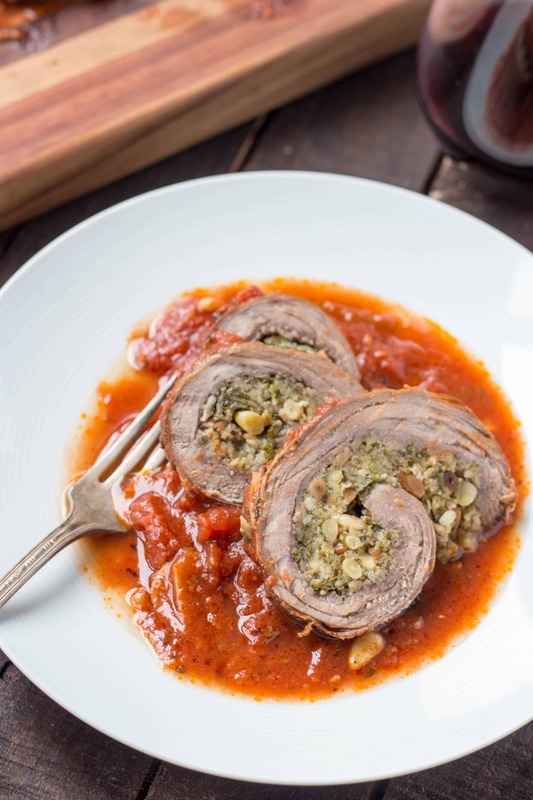 Tender beef rolled up with breadcrumbs, pine nuts, raisins, cheese and simmered all day in a rich tomato sauce. Perfect for Sunday supper! Where I come from, Sundays are for gathering with family over long, early afternoon dinners consisting of meats braised in red sauce and lots of red wine. In my family, we always had a combination of meatballs, Italian sausage and stewed pork along with plenty of pasta, a bowl of ricotta, the occasional salad and of course, my Pop-Pop’s freshly baked bread. 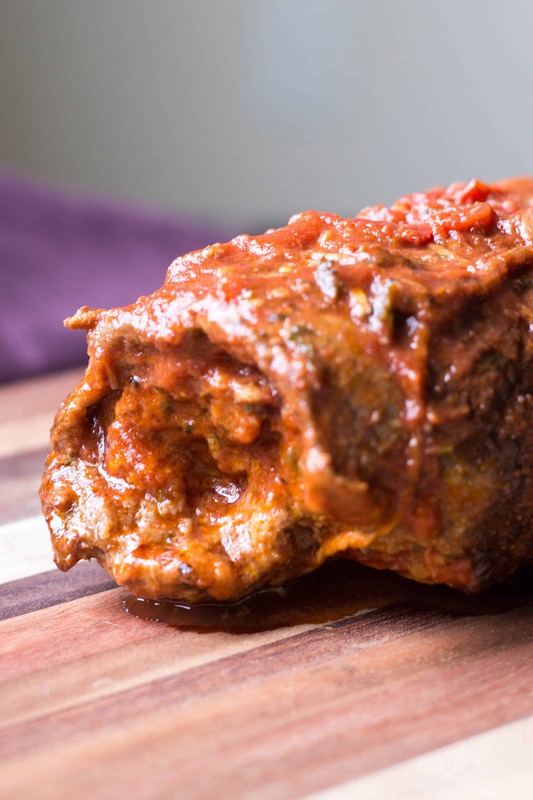 I didn’t try braciole until I was in my early twenties, and even though it wasn’t something I grew up eating, it tasted like home. Ever since, braciole has found a permanent spot on my Sunday table. 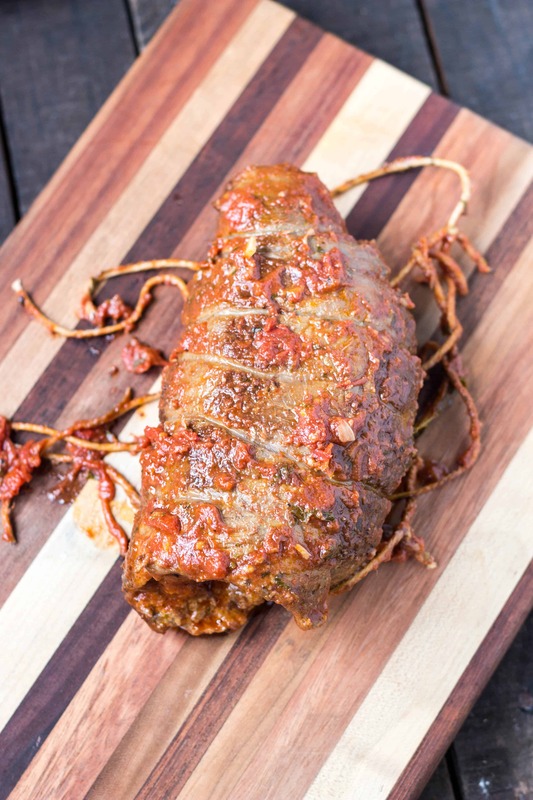 If you’ve never had braciole (pronounced brah-jhole) before, it basically tastes like a warm hug from an Italian grandmother. Thin slices of beef are rolled up with with a mixture of breadcrumbs, cheese and herbs, then stewed in a red wine tomato sauce until tender. I grew up eating a dish called spiedini, which is similar to braciole in that it’s meat rolled up with breadcrumbs, herbs and cheese, but it’s really a horse of a different color. Spiedini uses pecorino Romano, lots of onions and bay leaves and gets baked, while braciole uses parmesan, a little bit of garlic and parsley and gets braised. 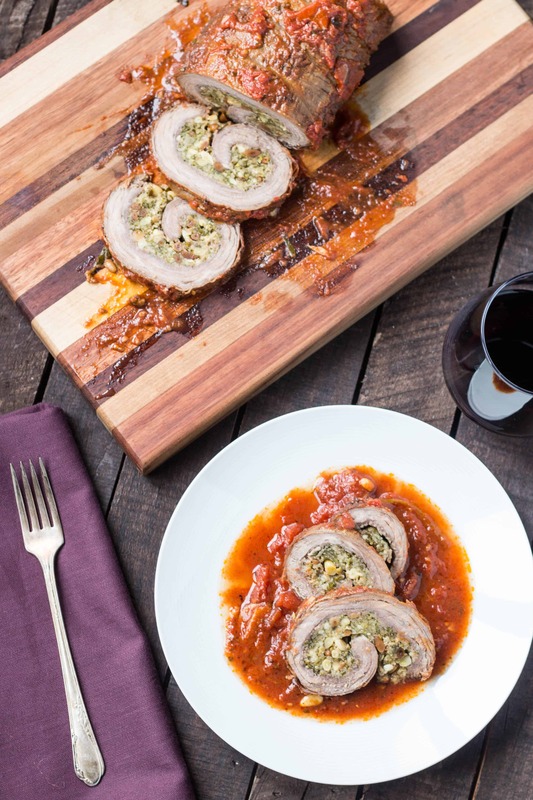 Just because its called Sunday Braciole doesn’t mean you have to eat it on a Sunday. For me, slow cooked Italian meals are synonymous with Sundays. But this dish will taste good any day of the week. In fact, it usually tastes even better the day after you make it. I find that by preparing this on a Saturday and leaving it in the pot overnight makes my Sunday all that much more enjoyable. Instead of spending the day slaving over the stove, I can be as lazy as I want (which is very lazy), since all I have to do for dinner is warm the braciole back up, slice and serve with some pasta and sautéed greens. 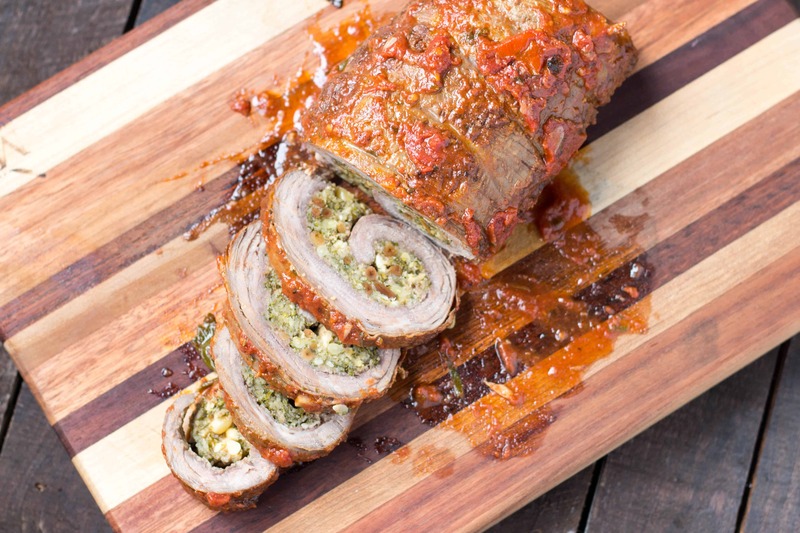 Just like spiedini, meatballs and even marinara sauce, there are hundreds of different ways to make braciole. No one way is the right way. You can make little individual bundles with really thin pieces of meat, similar to how we make spiedini. Or, you can do like I did here and use a large cut of flank steak and slice it into rounds. You can change up the filling and adjust the flavors to make it your own by adding different cheeses, vegetables or charcuterie. I’m using the classic combination of garlic, fresh Italian flat leaf parsley, seasoned bread crumbs, toasted pine nuts, golden raisins and lots of parmesan cheese. If you aren’t a fan of raisins, look, I get it. But consider trying them out in this dish. It might change your mind! A sweet, juicy golden raisin paired with a savory, tangy dish is a completely different experience than what you get from an oatmeal raisin cookie. I like to rehydrate the raisins in a bit of white wine before adding them to the mixture, which plumps them up and infuses them with incredible flavor. As the meat braises in the tomato sauce, a few of the raisins fall out and impart their naturally sweet flavor into the sauce. Not so much that it makes it sweet, but just enough to perfectly balance out the acidity. If you really can’t get down with the whole raisin thing, just skip ’em. But be sure not to skimp on the parmesan cheese. Like I said, I get not loving raisins. But I will never understand you strange people who claim not to like cheese. Speaking of cheese, did you happen to see all the articles last week about how lots of different companies are under fire for adding significant amounts of cellulose, aka wood pulp, to their grated cheese and calling it 100% real parmesan? Yeah. It’s a thing. I’ve never been a fan of pregrated cheeses in general. They always have an off flavor due to all the anti-caking agents, fillers and preservatives used to keep them from sticking together and growing mold. The only time I buy pregrated cheese is at a cheese shop or Italian market where I know the store is grating the cheese in house. It’s always fresh, free of additives and tastes sooo much better. If you don’t have access to a store that freshly grates cheeses in house, opt to buy it whole and take the few extra minutes to grate it yourself. And hey, while we’re at it, make sure you spring for the good stuff. Look for genuine Parmigiano Reggiano or Grana Padano – it will make all the difference in the world. Place the raisins and white wine in a small saucepan and bring to a boil. Remove from the heat and allow to sit for about 15 minutes. Drain and place the raisins in a bowl. Add the chopped parsley, grated cheese, minced garlic, bread crumbs, pine nuts, and two tablespoons olive oil, then mix to combine. If the flank steak is very thick, butterfly it to make it about 1/2 inch thick. Pound the flank steak out with a meat mallet to tenderize and flatten. Sprinkle both sides with salt and pepper. Spread the breadcrumb mixture out evenly over the flank steak, leaving a 1/4 inch border on all sides. Starting with a short end, roll the meat up, being sure to keep as much filling inside as possible. Use some butchers twine to tie it up about 3-5 times around to keep the roll intact. Heat the remaining two tablespoons olive oil in a medium-large saucepan. Brown the meat roll on all sides, then remove from the pan and lower the heat. Add in the minced onion and sliced garlic and cook until softened, about 2-3 minutes. Pour in the red wine, tomatoes and bay leaf, then season with salt and pepper. Bring to a boil, then place the braciole back in the pan and spoon some sauce over top. Turn the heat to low and let simmer, rotating every 20-30 minutes, for about 3 hours. 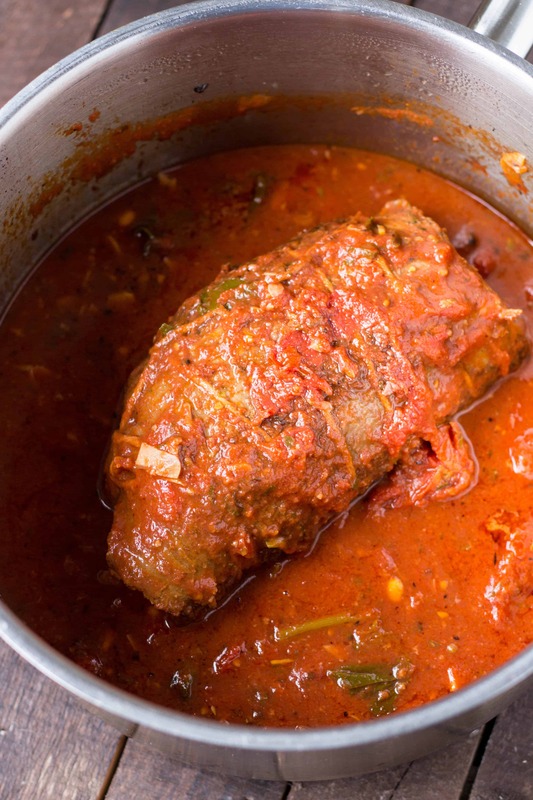 Once tender, remove the braciole from the sauce and let rest on the counter for about 20 minutes. Slice into rounds and serve hot with pasta or polenta, with plenty of sauce on the side. I’ve never had, or even heard of, spiedini or braciole. Both sound divine. And thanks for the heads-up on who is sneaking wood pulp into our cheese. Besides, how are you supposed to snack on thin slivers while you cook if you only buy grated? If you had to make one first, I’d push for spiedini. But boy are they both good. It’s my childhood on a plate. Looks very delicious! This recipe I have to try! Very nice photos aswell. Could you please clarify the amount of flank steak for me? Hi judie – the recipe calls for one whole flank steak that weighs approximately 1.5 lbs (it does not have to be exact, just a ballpark). Hope this helps!